Three fern species are indigenous to my yard. By indigenous I mean they grew here before I came along and continue to spring up on their own. This makes them good garden candidates for obvious reasons. To start a successful garden, take a look around and see what wants to grow naturally. Western Sword Fern (Polystichum munitum) is undoubtedly the most familiar native fern of the Pacific Northwest (left photo). It is easy to spot along roadsides in forested areas. Take a hike in a coniferous forest and you will find it covering the ground under the firs, hemlocks and cedars. It also makes a beautiful and easy to grow garden plant. In my garden, they have also been surprisingly drought tolerant through the summer. I seem to have a "Sword Fern nursery" under the breezeway deck that has been the source of many of my garden plants. 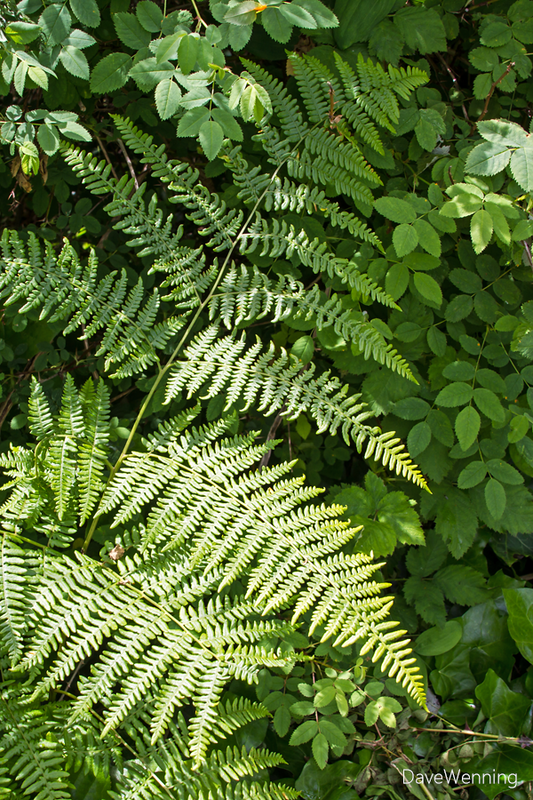 The Bracken Fern (Pteridium aquilinum) is another familiar local fern (center). 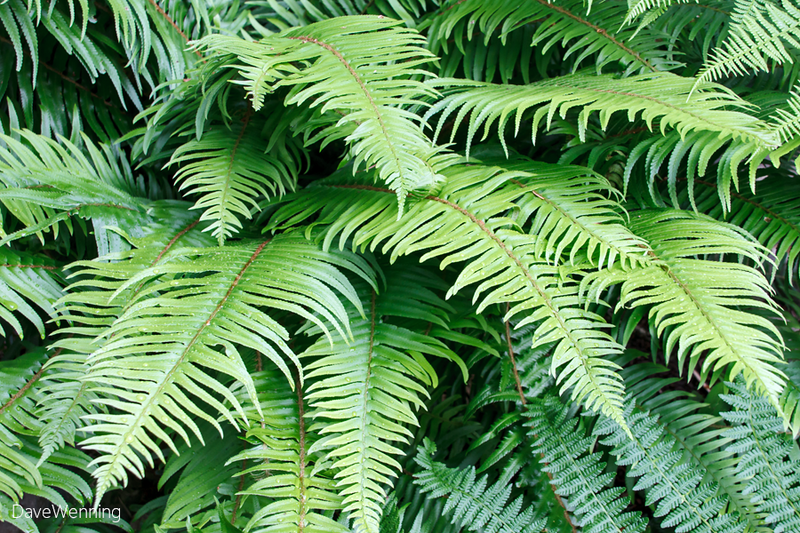 The scientific name translates to "eagle fern," apparently for the winglike pairs of fronds along the main stem. 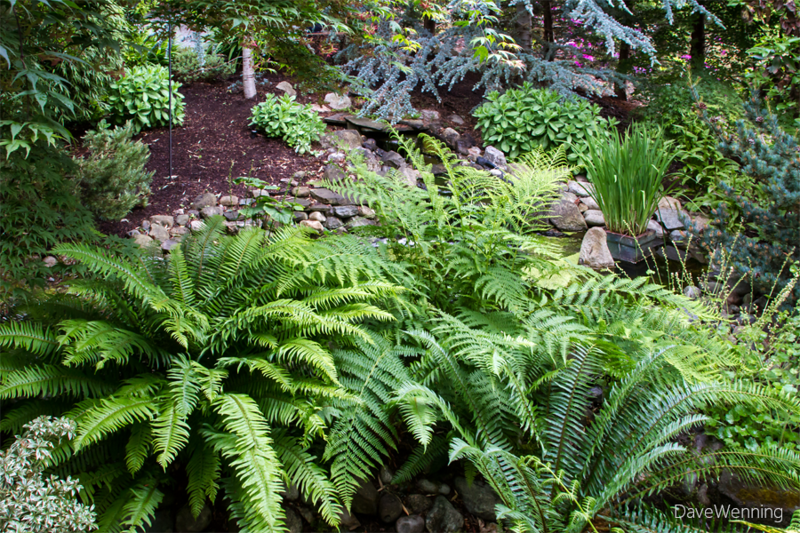 If you have a yard, a farm field or a vacant lot, you probably have Bracken Ferns. This is not one of my favorites. Where it springs up on its own, it tends to be, well, weedy looking. I do let it grow along the edges of the yard. The one in the photo is growing with the Nootka Rose along the bank to the beach. 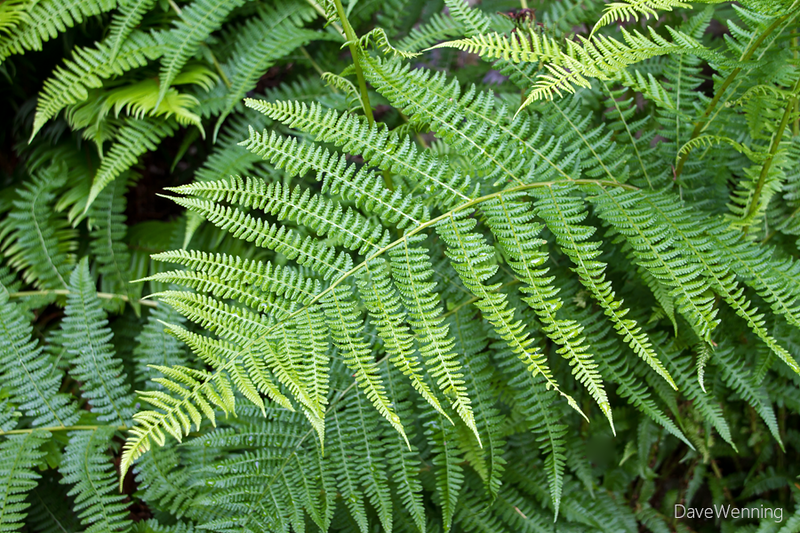 Bracken Ferns were eaten by Northwest Coast native peoples. While the plant has been associated with stomach cancer, cooking is said to quickly denature the carcinogen. The largest and most dramatic fern in my yard is Lady Fern (Athyrium filix-femina) shown in the right photo above. It is also the most beautiful. 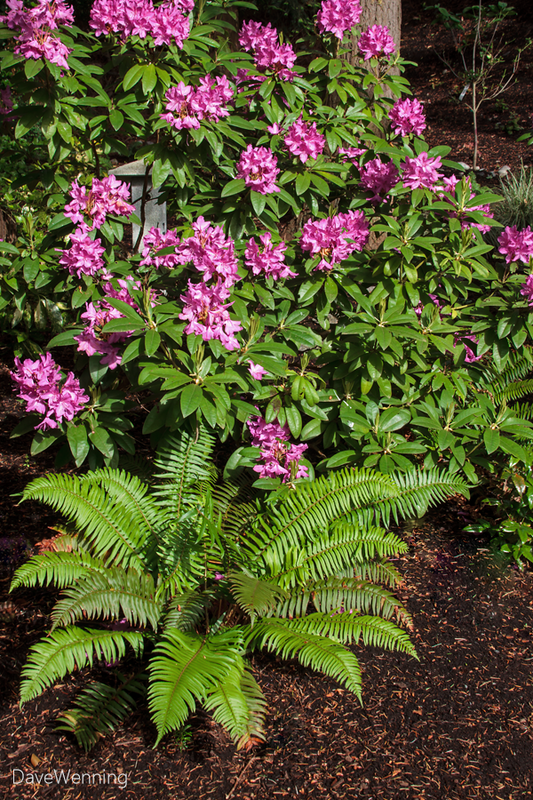 Unlike the Western Sword Fern, this one dies back every fall, then returns with fresh new fronds in the spring. Though I have several, I have never planted a Lady Fern. They have all come up on their own and I just let them stay in these spots. This one prefers moisture, so they are indicative of wet spots in the yard. The fronds are very delicate and easily broken so I walk past them carefully. The Deer Fern (Blechnum spicant) is another native I have spotted growing along the trails in Deception Pass State Park nearby. I planted this one from a local nursery last year. The tall, slender fronds rising above the main plant bear the fertile, spore producing leaves. Can you spot the caterpillar on one of the fronds? It won't find much of a meal on the Deer Fern. Ferns are pretty much left alone by garden pests, another reason I enjoy growing them. These primitive plants also don't seem to ever need fertilizing. 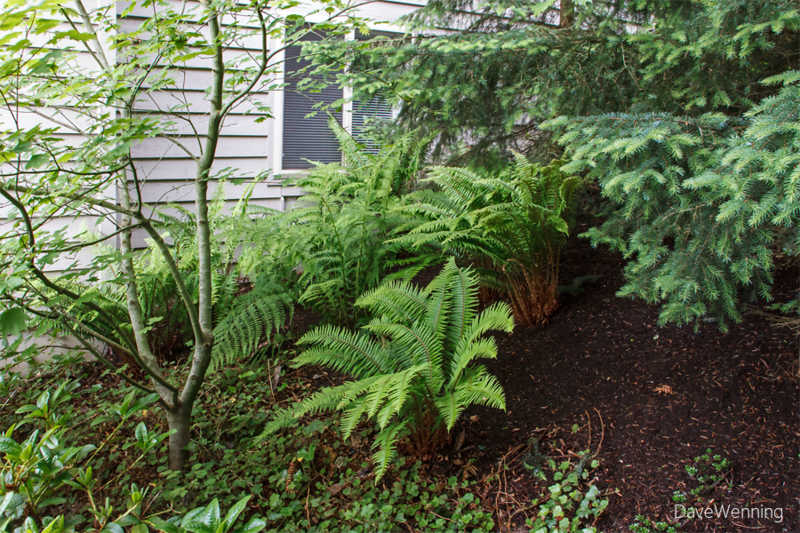 Several Western Sword Ferns are growing under a Vine Maple and Serbian Spruce on the east end of the house. I planted some along the foundation and others have come up on their own. One big Lady Fern has joined them. The front yard gets full sun in the morning and most of the afternoon. 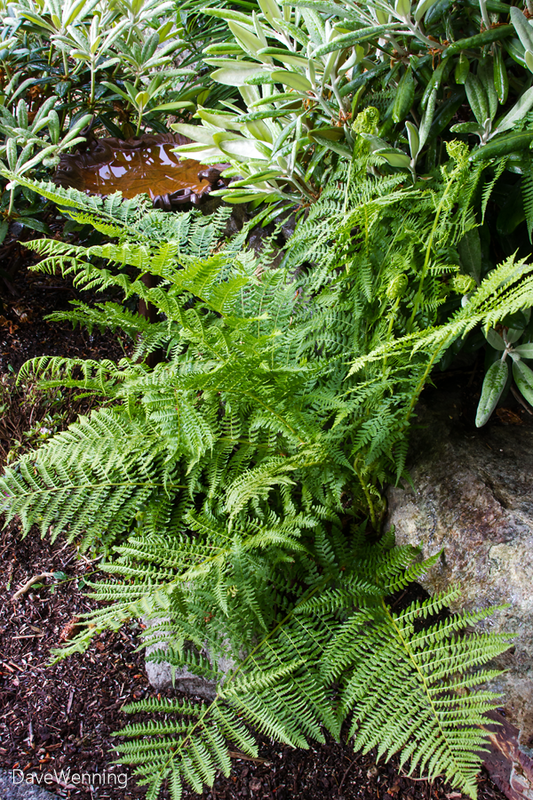 Nevertheless, Sword Ferns and Lady Ferns have come up on their own here. They grow in the spaces between the rocks in the low stone wall at the base of a bank. 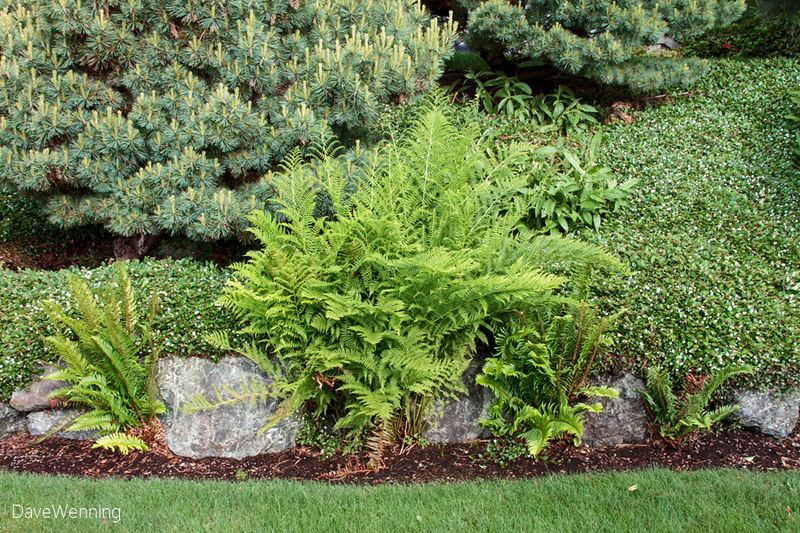 Moisture will move down slope and collect behind the rocks creating conditions that ferns like. In the back yard, the entry garden includes a small koi pond. Herons, otters and raccoons don't allow me to keep koi, but both planted and wild ferns thrive in this spot. They enjoy the shade of a large Japanese Maple, Acer palmatum 'Osakazuki.' I originally tried to grow Primroses, Japanese Iris and other nursery plants along this path, but none of them survived. As a last resort, I transplanted some wild Sword Ferns from other places in the yard. Fifteen years later, they are still going strong. In the spring, I like to prune off the old dead fronds from the previous year. At the edge of the pond, the wild Lady Fern in the center of the photo is almost shoulder height this year. This is a shot from my entry porch. The pond is used daily by birds coming for a drink and to bathe. They come in groups by species at different times: Goldfinches at 10 o'clock, Robins at noon, Varied Thrushes at two, and so on. The foliage around the pond allows them to feel safe and protected. 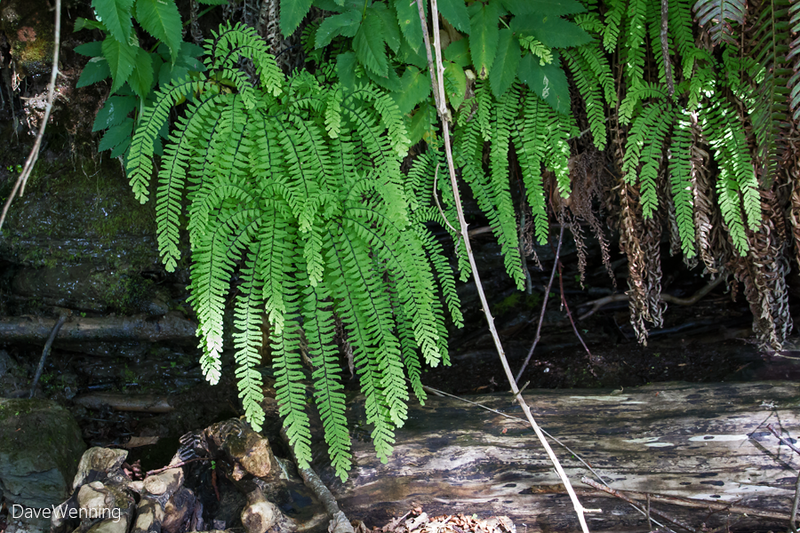 Maidenhair Fern (Adiantum aleuticum) is another native I want to try in my garden. This one is growing up the beach out of a clay bank along Similk Bay. There is a lot of water constantly seeping from the bank which is what this species likes. That is the problem in my yard, finding a shady spot with enough moisture to satisfy it. 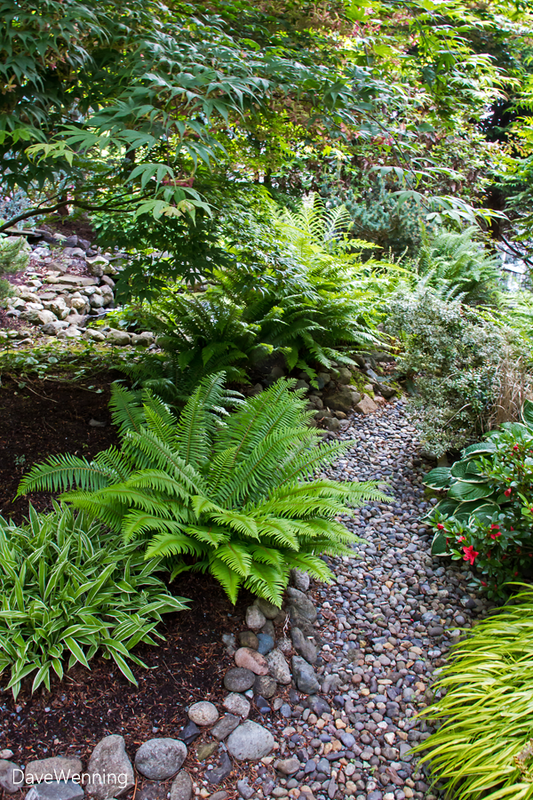 Just planted this year, my new "forest floor" garden in the back corner of the yard features Western Sword Ferns. Except during early morning, this spot gets full shade all day. A carpet of ferns will become the dominant plant in this understory, exactly what I see along the forest trails where I love to hike. They have already doubled in size since they were planted in February. 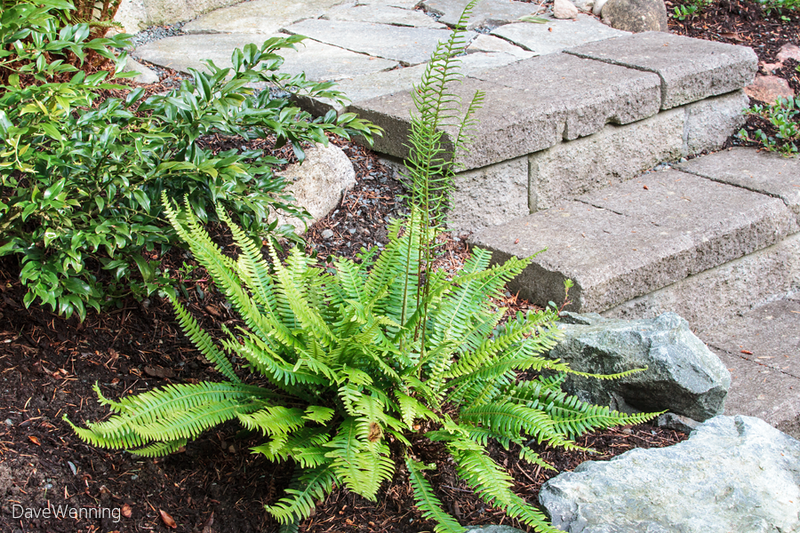 Easy to grow with minimal demands, ferns have become one of my favorite garden plants. These natives seem to thrive where nothing else will grow. They also look beautiful and add something special to the garden. The can be accent plants, companions to shrubs, ground covers or borders. Just stick them in the ground, get out of the way and let nature take its course. trying again, beautiful, love ferns! 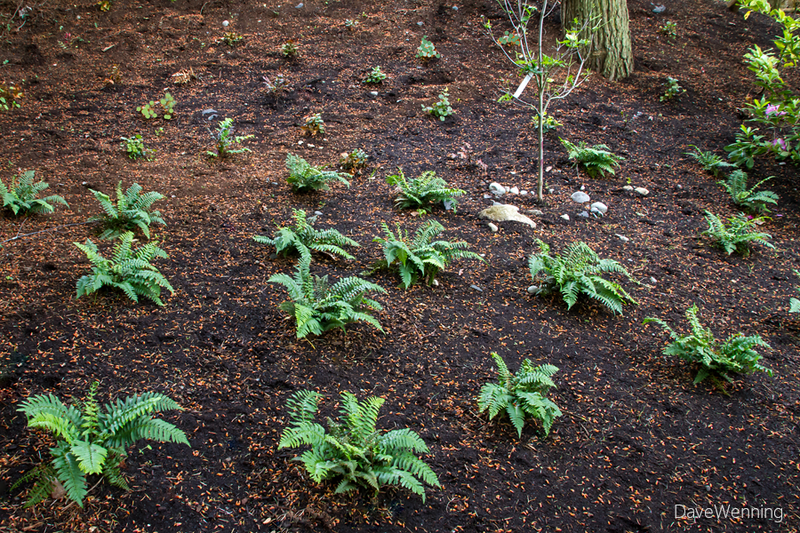 have lady ferns and sword ferns volunteering in a patch of salal I planted in a shade spot. admire your native garden and working with the natural habitat preferences.